Ohh… now I see. Yep, that is correct. Each color is differently keyed. There are a couple of teams that I’ve seen use the green ones and take a dremel to them to mate them with the red. They will use green on their battery chargers and red on the batteries to make it more difficult to plug the wrong things together. We use a different approach. We bolt down any SB50 that isn’t on a battery. Always plug a loose connector into a bolted down connector. 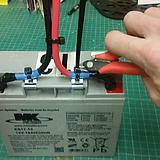 Our experience with upgrading battery wiring size was positive. We went to #2 gauge and SB120s. The increased performance and ruggedness was, we felt, worth the weight and expense. We also get the added peace of mind of having worked out the tooling and process for getting really great crimps ourselves, and we get to visually inspect each and every lug before it goes into the housings. The SB120s are substantially larger, for sure! We made a small SB120 to SB50 adapter so we can continue to use our battery beak, and in case we need to plug a SB50 equipped battery into one of our chargers. Language in R44 would make it illegal to use on the robot, however, so we were limited to our batteries by making the change. That’s certainly an argument in favor of staying with the smaller connectors, but in practice it was never an issue. Our biggest reason for not moving to SB120s is it would prevent us from easily loaning batteries to other teams. If we did ever make the move to SB120s we’d likely need to bring 3-4 batteries with SB50s to make sure we had them for other teams and alliance partners. I was going to make that same comment! Also, thanks Andy for posting the above picture. I was looking for a comparison photo last night and couldn’t find one easily. What was the nominal diameter of the heat shrink you used, and where did you source it? Note that the 2017 rule R37 provided specifications for the battery; the list was in a “blue box” and intended as a “pre-approved” list of models teams could use without additional [strIke]modification [/strIke]documentation. The description in appendix A speaks more to the list and only hints to the specifications. 3/4" 3:1 Ratio Dual Wall. It was sourced from the finest of the fine purveyors on the Bay of e. I’d give you a link but I’d use those terms to search and you can find a version of it. It’s nothing particularly special. Note that the 2017 rule R37 provided specifications for the battery; the list was in a “blue box” and intended as a “pre-approved” list of models teams could use without additional modification. The description in appendix A speaks more to the list and only hints to the specifications. It will certainly benefit many teams to upgrade from the small screws usually supplied with batteries. The holes in battery terminals will take a #12 bolt, so our team uses #12-24 serrated flange bolts from mcmaster.com with matching lock nuts. The serrations on the bolt bite into the terminal, and when properly tightened the connection will withstand far more torque and abuse than should ever be applied to battery terminals. The bolts are 97646S245 and cost $4.19 for 10 bolts. The nuts are 91831A025 and cost $7.19 for 50. You can replace all the small screws on 10 batteries for about $20. For cables we use #6 welding cable due to its greater flexibility. A good source is www.remybattery.com, which sells 6 AWG cable for $1.03 per foot. You can order as much or as little as you like. We attach the cables oriented toward the side of the battery, and cover the terminal with rubber covers from remybattery.com. We generally use the “straight/angle lug protectors” that cost $2.50 each. Although a bit expensive they look nice, work great, never wear out and make it possible to check the connections periodically. To prevent terminal loosening, we use edge-biter clips and zip tip the leads to the clip. Never had a loose cable since we started doing this 6 years ago. The clips are Panduit MCMS12P-C , available from Digikey and other vendors. If you aren’t needing to cut any strands or swage the 6awg terminal for the SB50 your effective wire diameter is likely not 4awg equivalent. We have found some brands of 4awg wire to not offer as much copper and have a wire diameter closer to 6awg. It fits and it is 4 awg wire. Of note, while I was getting samples I did find that copper clad aluminum 4 awg wires were much larger than full copper 4 awg wires. They are also much worse at conducting. Hmm. Our 4awg cable has 392 strands vs your 370. The strand diameter (.25mm) is supposedly the same, for about 6% more cross section area. Our battery cables are much bigger & more powerful than yours, and they work! This is exactly what I was referring to. I have used 4awg wire on robots since 2000 and have come across all sizes of supposed ‘4awg high strand count’ wire. If I am making a concerted effort to upsize my wire for current, heat and voltage drop reasons, I am going to use the largest stuff I can that still fits in the 4awg ring terminal (which has a significantly larger OD than the .22" SB50 ID). For reference and comparison, the 4awg Molex ring terminal we use on our batteries has a .280" minimum ID for the wire. I do agree though about not all wire being equal. The larger stuff I’ve seen listed as 4 awg and held has not been OFC or bare copper though, it’s been CCA - it’s lighter but it doesn’t conduct as well based on the measurements I’ve seen and what I’ve read. I think your references and Nate’s are both great for teams to have access to and understand. Just helping to provide more information for people to leverage. I can’t quite tell from your picture – did you just bend the battery terminals toward the center of the battery, or are you using pre-bent lugs? These are the 90 degree lugs I was able to find for 4awg. I assume these are similar to what Jim is using. You can also use your DigiKey voucher for these if you haven’t done so already. Marshall, Which diameter Nord-Lock Wedge lock washer did you guys use from Mcmaster? The 0.350" OD or the 0.430" OD? You use, and specify, cable lugs with a 1/4" bolt hole. Is there an advantage over using using lugs with a #10 bolt hole that matches the battery terminals on the permitted batteries and the bolt sets that are provided by some battery makers? The smaller hole would provide more mating surface (less resistance, less heat) between the lug and the battery and provide better gripping for the washers. I believe purchased cables, which come assembled, use the 1/4" hole as well, but I think this is for the robot side of the power cables where the bolt posts are 1/4". Alternatively, has anyone widened the holes in the battery terminals to 1/4" and used 1/4" bolt sets? Is this allowed? I see the same thing. I have seen online specifications for 6 AWG wires and lugs ranging from .167 for single strand to .25 for the 1000+ strand that I use. I figure more strands leaves more air gaps around the strands, but when crimped properly the air gaps are eliminated provided a nearly solid wire under the crimp. Cutting some strands to fit in the .22 SB50 lugs slightly increases resistance over a length of less than 1/8". 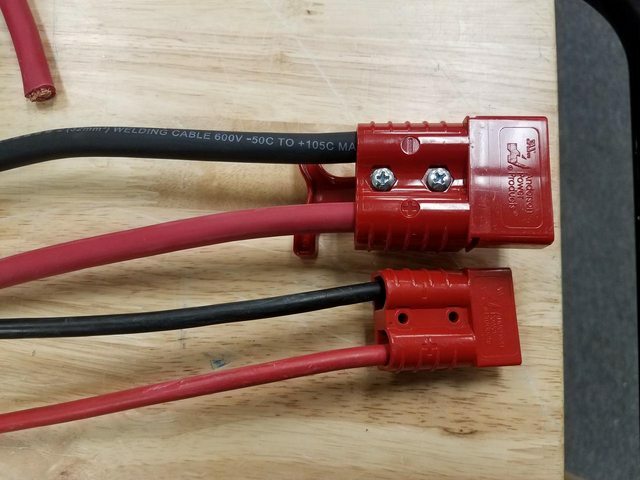 I don’t worry about this because it is less significant than using 50 AMP connectors on 75 AMP AWG 6 wire in front of a 120 AMP circuit breaker on a application that pulls over 200 AMPs for up to a few seconds! I would use #2 wire in SB120 connectors but this is less important than having a driver that is 5% better. Is there an advantage over using using lugs with a #10 bolt hole that matches the battery terminals on the permitted batteries? Yeah, we think so. In general, by increasing L/D ratio of the fastener, we decrease the stiffness of the bolted joint and make it more able to ride through a wider range of external load conditions without losing complete preload. Here is the lug we have used. We use #10-32 SHCS with nylon locknuts. Between the battery terminal and the cable lug we use 97527A005, an internal/external tooth lock washer with a slight belleville shape. It is the best washer I’ve seen. Is there an advantage over using…the bolt sets that are provided by some battery makers?